Flower Color: Deep Reds through Yellows and Whites. Can have more than one tone. The beautiful and exotic scented Plumeria can be found in tropical areas around the world as well as all around the coastline area of the Big Island. The Plumeria is prized for both its fragrance, which ranges from sweet to spicy to citrus; its flowers for their beauty and strength and endurance. 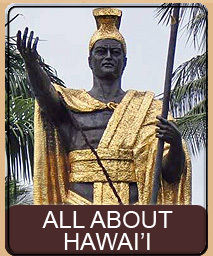 Its flowers are very often used in leis and hold up remarkably well as well as being quite intoxicating to constantly smell. 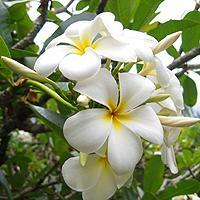 The Plumeria is a small tree with gnarled branches. 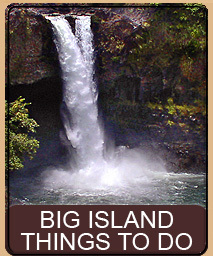 It prefers full sunshine and not too much moisture, which explains why the Plumeria on the Kona side of the island tend to bloom more frequently than the Hilo side, where it is moister and cloudier. Plumeria is seasonal and will drop its leaves during part of the year, though which part depends greatly on the specific Plumeria and its environment as it adapts to the local weather pattern. The tree needs to bloom in order to branch and even a single branch will bloom in order to continue growing. 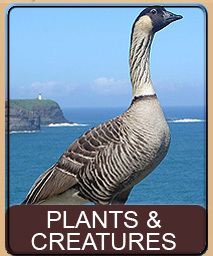 Leaves only propagate outward from the new growth so much of the tree itself is bare of both flowers and leaves. One of the delightful things about a Plumeria is that when it is bare, you cannot tell what color or style the blooms are. There are many different colors, shapes and styles of Plumeria, but most flowers have 5 petals that start as a curled or spiraled long bud and unwind or un-spiral to open. 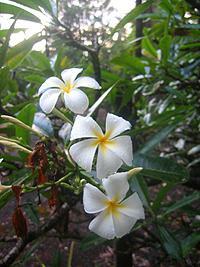 However, it is not uncommon to find Plumeria with more or less petals than 5, there are quite a few varieties. 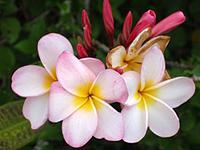 The colors of the Plumeria range from dark purple, through the reds, pinks, whites and yellow. 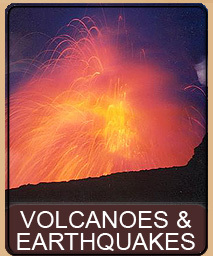 Some are solid in color while many are multi-color exhibiting two or more colors usually radiating from the center out. 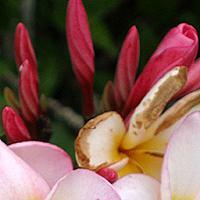 Some varieties of Plumerias open only a very small amount, unfurling just a bit. These are called Tulip or Shell Plumeria. One such tree is behind the Dolphin Bay Hotel and it is a beautiful peppermint coloring, with red tips to the spiral and light pink to white on the inside. 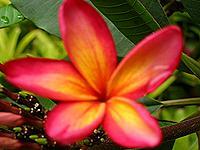 The petal of the Plumeria is very soft and velvet in texture. 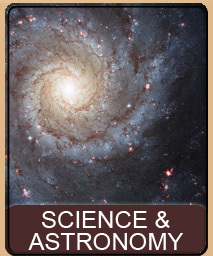 It is surprisingly thick and thus fairly strong. Petals that drop to the ground usually stay fresh for a day or two and it is not uncommon to see someone walking by stop to pick up a flower and put it in their hair (men, women, and kid). 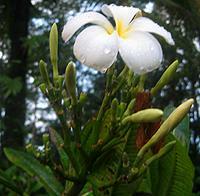 A Plumeria can be started from any part of the tree itself. If a branch breaks off it can be replanted -- just allow the branch to dry out for a couple of days and then replant it. A Plumeria loves fairly good drainage and seems to take well to lava rock with a few inches of topsoil (not red lava rock however, it is too dense for the Plumeria to root). 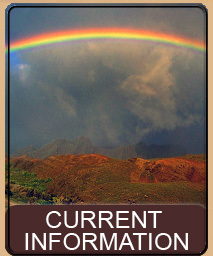 This page is named 'Plants.plumeria'. Can't Find It?